We don’t need to present Lumma, the world famous face-lifter of a curves of cars many brands. I like their parts from the time I’ve found that they’re exist. Let’s take a look. A sporting, but still decent plastic with a modest but aggressive shapes and sophisticated every line. My reason is - the tuning as should be. But you all know Lumma Tuning company so let’s go to see their new product. This time they took under their scalpel Opel Corsa type C, which looks like very well also in stock production. Lumma made a whole new front bumper also with a car mask ( I won’t judge its shape, it’s typical Lumma, so it’s like it should be), In the front bumper, there is obviously also a grid mounted, so it isn’t any cheap semi-product. An another look in front of Corsa – eyebrows from quality ABS plastic were added, so she looks more aggressively on the world. Whole smooth front part effects with more harmonious and fine impression. A look from other side - we can’t disregard massive doorsteps with image hole in their rear side on the Lumma Corsa. Also the driving mirrors couldn’t escape attention and we can found beautiful ones in the M-Technik style, instead of stock ones. It’s true that prettier mirrors haven’t been invited yet. Plus their electrically controlled and also heated. 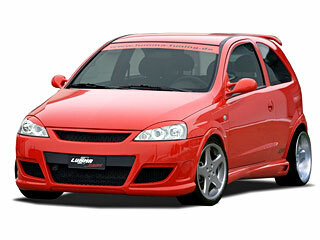 So let’s take a look at last accessories creating a body-kit of the Corsa GS/R by Lumma Tuning. A rear side of car is improved by a sporting rear bumper with three wide, low holes, knotting on the lines of a rear mudguard. But not only a mudguard is new in the rear side. There is a roof spoiler at the end of roof, or on the rear window. It’s made in 2 types. One for normal version, without an integrated roof spoiler, and second for the Gsi version with a spoiler in the stock. Last thing provided for Corsa C by Lumma Tuning is a sporting heelpiece with the four oval exhaust tips with 76 mm in a diameter. Take a look on the photo – it looks really wild. This tip is also suitable for the diesel engines. The company is situated in Winterlingen, not far from Stuttgart in german Baden-Württemberg. Founded in 1987, so it has started designing and producing spoilers in more than 17 years and now it’s in the elite of an European tuning scene and their brand is a guarantee of the quality. This confirms also high quality and beautiful design of these products. Despite of a general recession in west Europe, Lumma is fighting against this negative trend by a permanent investment and new products. Month by month, they’re inviting new sets of spoilers for some car and also for a brand new models, which are only few moments in stock-production. Now, the company is proud to have own design department doing new projects and concepts permanently. Usually, the companies like Lumma are making trends and changing them. They’re offering brand new products (not many producers offer them), like extreme bumpers for Audi, BMW, Opel, VW and also whole sets for other European brands. Company supplies independent spoilers and bumpers, but also whole mounting sets, or body-kits, or spoiler sets for the particular car. Lumma Tuning is a specialist only on exterior of the car – mostly sporting bumpers, spoilers, masks, doorsteps, wings, moldings, air dams, exhausts and many other plastics in the best quality. Of course, all Lumma’s products are certified and homologized in EU and have TUV (Technischer Überwachungs-Verein) and DEKRA (Deutscher Kraftfahrzeug-Überwachungsverein) certifications. 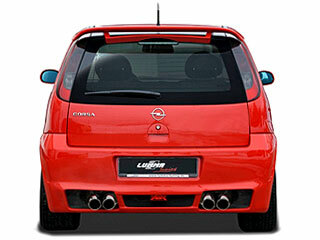 Do you like the Opel Corsa C tuning by Lumma?